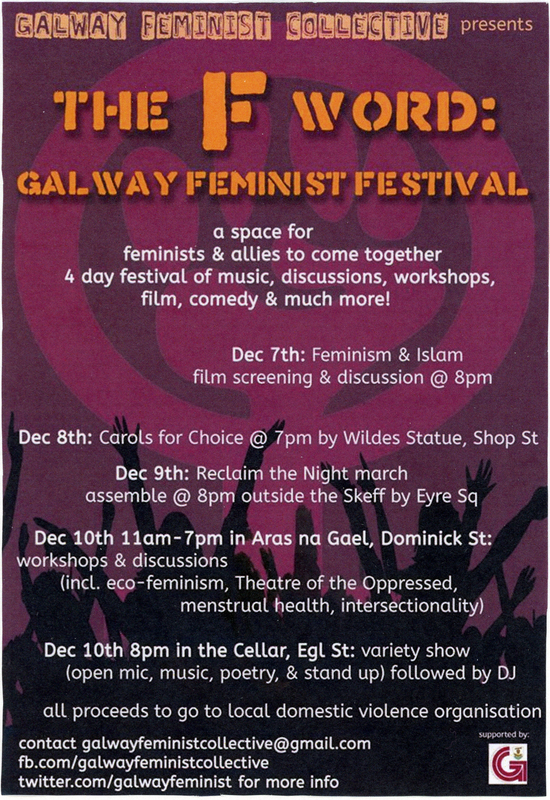 This small handout announces “The F Word: Galway Feminist Festival, a space for feminists & allies to come together | 4 day festival of music, discussions, workshops, film, comedy & much more!” Events include a “Carols for Choice” gathering, a “Reclaim the Night march,” and workshops and discussions regarding “eco-feminism, Theatre of the Oppressed, menstrual health, and intersectionality,” all of which took place during December 7-10, 2016. A second Galway Feminist Festival was held during July 5-9, 2017. The flyer design was seen in different sizes along the streets of Galway, but this particular flyer was obtained from the festival’s first event, “Feminism & Islam,” a film screening and discussion. All proceeds from the festival went to a local domestic violence organization, the Galway Pro-Choice campaign group.